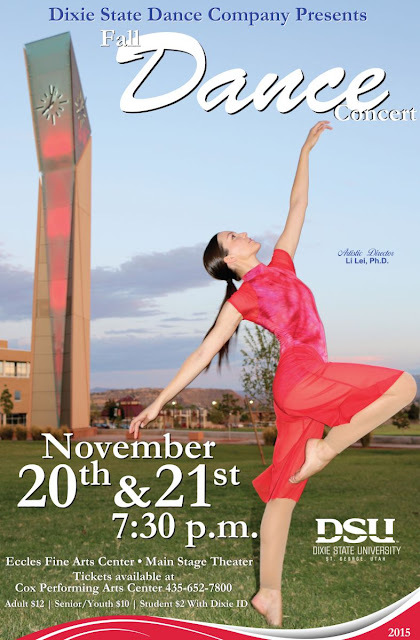 I went to a DSU Fall Dance Concert when I was in college and loved it! It was for extra credit for my humanities class and it was so great. I love watching dance and it was a bonus because one of my friends was in the concert! It was fun to watch her. The dancers that will perform are 24 full time students who are part of the Dixie State Dance Company. This concert is one of two that the dance company does each year. The concert sells out so be sure to get your tickets in advance or arrive early (but I'm not going to promise their will still be tickets available)! Dress: Casual dress is appropriate but if you wanted to dress a little fancier that would be fun too!